One-Hour Special Reveals Last In-Depth Television Interview of Robin Williams; Emmy-Nominated Series Offers Star-Studded Celebration of the Late Actor’s Work. ARLINGTON, VA; SEPTEMBER 2, 2014 – In celebration of award-winning comedian, TV star, and film and stage actor Robin Williams, who lives on in fond memories of audiences worldwide, PBS will premiere ROBIN WILLIAMS REMEMBERED – A PIONEERS OF TELEVISION SPECIAL on September 9, 2014, at 9:00 p.m. ET (check local listings). The one-hour special will feature Williams’ last full-length television interview, including never-before-seen footage of his comments on life and work, tributes by those who knew and worked with him closely in all phases of his career, and clips from iconic moments throughout his career. Williams shares stories about his first stand-up act, his desire to be a serious dramatic actor and his tireless efforts to entertain U.S. troops overseas. 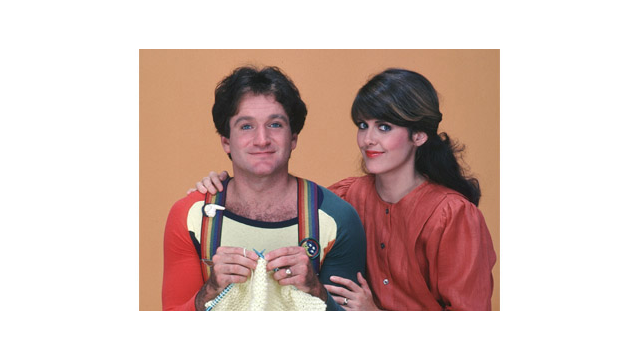 The program also includes an exclusive, new interview with Williams’ former “Mork & Mindy” co-star Pam Dawber, who shares for the first time on camera since his death, her memories of working with him. Dawber was the actor who worked most closely with Robin Williams, and for the longest stretch -- more than four years. The two remained friends long after the show’s end and had spoken just a few weeks before his death. Celebrities and friends of the late actor were recently interviewed by filmmakers Steve Boettcher and Mike Trinklein at the famed Comedy Store in Los Angeles, where they shared stories and discussed Williams’ body of work, from stand-up to television to film. Featured interviews include remembrances from co-stars Henry Winkler (“Happy Days”), and Yakov Smirnoff (“Moscow on the Hudson”), to comedians Louie Anderson, Paul Rodriguez, Rick Overton, Blake Clark, and Pauly Shore, and comedy producer George Schlatter. Other interviews about Williams include: Penny Marshall, the late Jonathan Winters, Whoopi Goldberg, Jerry Stiller and Jimmie Walker. “PBS is proud to share with viewers a celebration of this comic genius’s life, through recollections from friends and colleagues, and reflections from Robin himself,” said Donald Thoms, PBS Vice President of General Audience Programming.